raya and the first wedding in the family. | escaped. raya and the first wedding in the family. OK I know I owe you a big fat apology for neglecting this blog for so long. It's not like I didn't have time to update. It's just that 1) to update I have to wait till my brother is asleep or haven't woken up yet or out or simply not around, 2) those are not likely to happen as he always sleeps later and wakes up earlier than I do, I swear. I don't know, I just feel uncomfortable writing blogs when he can see it, even if he's five miles away. I think he has this sixth sense he'd know whenever I write about him or about anything..it's just that way. Raya was splendidly beautiful. We had our first family reunion after five years of separated from each other (me in Japan, my second sister in New Zealand) so it was kind of heartfelt and a bit sad in gratitude that finally we managed to assemble together as a family. Our little family. So please go to my Facebook's account for the pictures, thank you. OMG, it was the best thing ever. Seeing your big sister in wedding dress and pretty veils, smiling happily as her husband took her hand and they walked together. It was such a pretty sight, it humbled me to the ground to realize that love is such a nice thing when it leads to marriage. A good pair of husband and wife; loving each other and wanting to spend their life together. It kind of made me realize that everyone is made for someone. Whether you've found him/her or not. 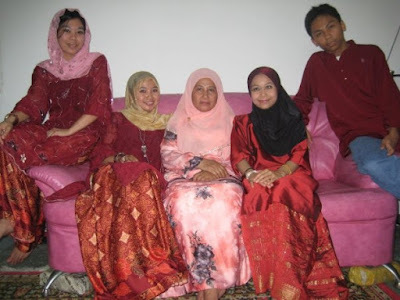 Of course, the days before the kenduri were disastrous. I had sleepless nights, a tired body and I had to smile and do the yes-I'm-the-bride's-sister-how-are-you chat all the way, while feeling like I need drugs to stay awake. 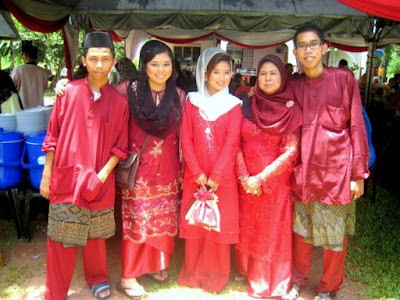 And the bloody mak andam ruined my hair. I HATE HER. It was a whole other story when my sister needs to stay at her mentua's house. It was sad; but funny in a weird way. In my sister's way. She was supposed to spend a night there, but you should've seen the amount of clothes and stuff she's bringing. I didn't know it was only one night, I thought it was the whole week or something. And before leaving for her mentua's house she kept on telling mum to pick her up the next day's morning. I kind of expected it because she has always been the manja one, but this one is serious. I promise I will update when I have the opportunity to do so/when my brother is out. tgk kat fb zatil gambo wedding and raye...cantiknyer zatil,seriously!!! cume time wedding tuh zatil nmpk sedikit berumur la,tp still lawaaaaa..
haha i know,nmpk older kan.sume ckp cmtu.sbb makeup n rmbt kot.haha. not just Hawe k, me too! Byk kali singgah ur blog but no update!